Pleasure Flights will be taking members of the public on what should prove to be an experience they’ll never forget when we take them on our ‘Lake District Trip’ this Saturday, 6th June. Flying from Greenlands Farm Village, Carnforth, Lancashire LA6 1JH (link to Google Map here), we offer our lucky passengers unsurpassable views and aspects of the spectacular landscapes that so inspired one of Britain’s greatest poets, William Wordsworth (and, indeed, his sister Dorothy). We offer two options for our Lake District Trip: a 15-minute trip; or a 30-minute trip. The 15-minute Lake District Trip takes us across Morecambe Bay – described as ‘Nature’s Amphitheatre’ and famous for its high adrenalin outdoor activities – and down to Lake Windermere. 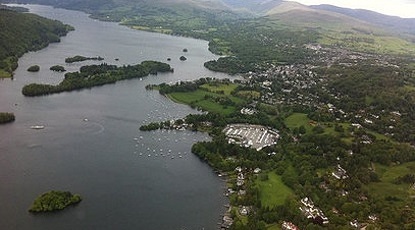 At 10.5 miles long and 219 ft deep, Windermere is England’s largest lake. Its name comes from the Scandinavian for ‘lake of a man called Vinandr’ – and it’s every bit as spectacular as the mythology and poetry it is steeped in would suggest. In particular, we take in the charming town of Bowness and Belle Isle. Bowness and features in Arthur Ransome’s much-loved Swallows and Amazons series of books and welcomes hoards of enchanted tourists from across the world every year. Belle Isle, meanwhile, is the largest of 18 islands on Lake Windermere and home to the striking Belle Isle House, built in 1774 and lived in by the wealthy Curwen family and its descendants until the early 1990s. Our 30-minute trip tracks across to heavenly Newby Bridge, with its celebrated five-arched stone bridge built across the river and famous luxury hotel, The Swan at Newby Bridge. This trip also takes in Lake Windermere but, in addition to the town of Bowness and Belle Isle, we will give you incredible views of Bowness’s marvellous Marina, the splendid Storrs Hotel and Ambleside. Beloved of Wordsworth, art critic John Ruskin and Beatrix Potter, Ambleside now one of the major centres for climbing and walking in the Lake District and flying by helicopter will give you sensational views of Stock Ghyll Force, a spectacular 70-foot waterfall not far from the town centre and one of the most photographed scenes in the Lake District. Finally, as a real treat to round the trip off, our return journey back to Carnforth takes across the spectacular Furness Fells, with its breath-taking hills and mountains rivalling anything you will find in the French Alps or Canadian Rockies.